After the graduation, send out thank you notes in style. These hand made note cards are an easy way to let others know you appreciate their kindness, and their gifts! These are perfect for both males and females of any age and in a smaller size allowing you to thank someone without having too much empty space after writing. 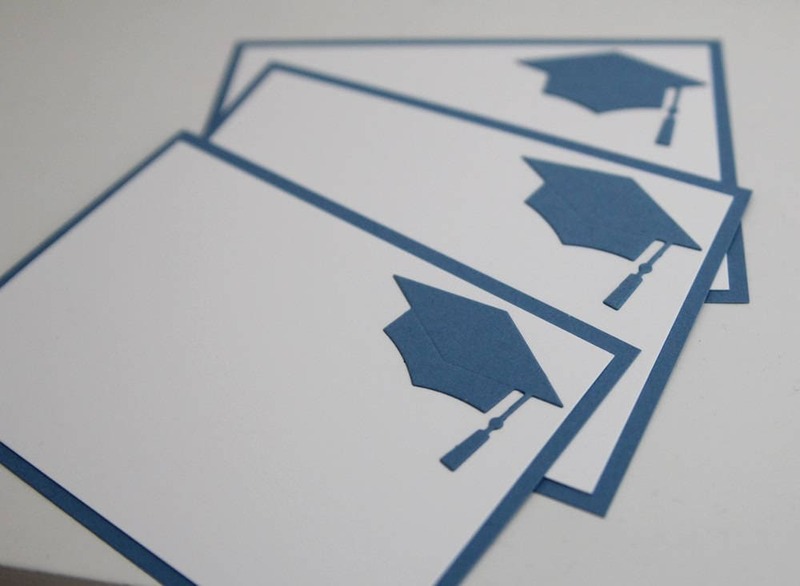 The cap image is die cut from blue card stock and placed on white card stock. This is then layered onto matching blue card stock. ** Please note that these are FLAT note cards, not foldovers. You will receive 10 flat note cards and perfect fit envelopes in this listing. ** Want in another color to match your school? Feel free to reach out to me. If I have the card stock that fits your needs, I am happy to change the colors. Cards measure 5 x 3.5 inches.